Primer: Apply one coat of Glossy Paints Wall Primer (WT / ST). Allow drying for 6-8 hours. Sand with emery Paper. Wipe Clean. 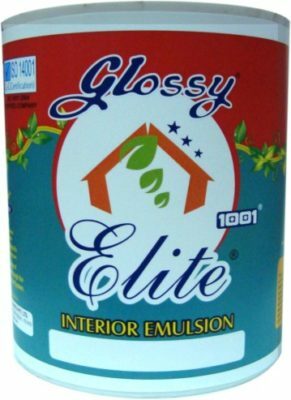 Putty: Smoothen the surface by filling dents with thin coats of Glossy Paints Acrylic Wall Putty or Glossy Paints White Stiff Paint mixed with Glossy Paint 1001 clear varnish. Primer: Apply another coat of Glossy Paints Wall Primer (WT / ST). Allow Drying for 6-8 hours. Sand with emery Paper. Wipe clean. Topcoat: Thin one litre Glossy Paints Elite Emulsion upto a maximum of 400-500ml of water. Do not over thin. For best results apply 2 coats of Glossy Paints Elite Emulsion.